Sporting Kansas City is going paperless! In a move that keeps Sporting Kansas City consistent with best practices, the club that earned its stripes delivering technologically progressive experiences to fans has decided to make its 2019 home matches mobile entry-only. In 2018, more than 80% of Sporting Kansas City’s Season Ticket Members entered Children’s Mercy Park through mobile entry, so the club isn’t expecting significant changes in fan behavior. 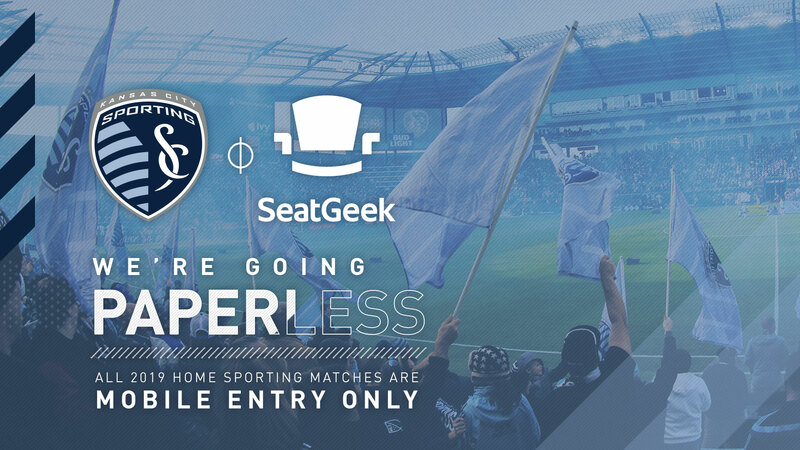 Still, Sporting KC partnered with SeatGeek, its official ticketing partner, to produce the following guide for fans looking to interact with the SeatGeek app. Mobile tickets can be accessed through the SeatGeek app, the Seatgeek mobile desktop site, and the Sporting KC app. Similar to the airline industry, Sporting KC tickets can then be stored in the Apple or Google Wallets before fans arrive at the gates. Sending tickets to friends on SeatGeek is super easy! Head to the “Tickets” section of your account and you should see an option “Send” your tickets. Once you select “Send”, you’ll be prompted to choose the quantity of tickets, the recipient, and, if you choose, a price (if necessary!) for each transfer. From here you can easily send tickets to any email, SeatGeek username, or U.S. mobile number by text. Hit the green “Send” option at the bottom and your tickets will be sent! Your recipient will then receive their notification via text or email where they’ll be prompted to accept these tickets into a new or existing SeatGeek account. You can also easily cancel a transfer that has not been accepted at any time through the SeatGeek app. You can list tickets by visiting the “My Tickets” tab on our app, viewing the ticket details for a specific event, and clicking or tapping the “Sell Tickets” button. As long as the tickets you want to sell have been uploaded to your account first, just set your price and how you want the tickets to be split! Promo codes can only be used when you are at checkout or signed into a SeatGeek account. It's easy and free to register and your information is safe and secure with us! It also makes future purchases a breeze.